Downed CIA drone: Was it rigged to self-destruct? 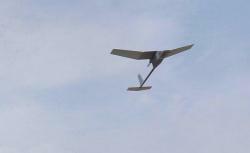 Can unmanned spy planes be destroyed from afar? Following the crash of a CIA-operated drone in Iran last week, experts have debated whether Iranian engineers could steal technology from the downed plane. Why doesn’t the Pentagon build self-destruct mechanisms into its sensitive technology? It does. As reporter David Axe discussed in his book War Bots: How U.S. Military Robots Are Transforming War in Iraq, Afghanistan, and the Future, the Pentagon was able to destroy its first generation of unmanned spy planes by remote control, in case they fell into enemy hands. And the feature really worked: Axe reports that pilots accidentally blew up a Northrop Grumman Global Hawk prototype during a 1999 test. The RQ-170 that went down in Iran last week probably had a self-destruct mechanism as well. The technology isn’t foolproof, though. If the plane lost contact with the ground, the self-destruct button wouldn’t work. Even when onboard explosives detonate, they don’t always completely destroy the vehicle. When drones have gone down in the past, the military has sent in manned attack jets to finish the job. The Pentagon has been using self-destruct technology for decades. During the Vietnam War, U.S. planes dropped sensors along the Ho Chi Minh Trail to detect enemy troop movements. If tampered with, the sensors would self-destruct. Today, computers on U.S. tanks and Humvees carry the Force XXI Battle Command Brigade and Below system, which uses GPS technology to display the location of all vehicles on the battlefield. If the computer falls into enemy hands, the Pentagon can remotely destroy it. Another incident from the Vietnam War shows how a self-destruct button can backfire. A U.S. communications engineer named Paul Katz equipped his innovative handheld radio with a button that destroyed the circuit board to keep the technology out of the hands of the Viet Cong. The problem was that our Vietnamese allies had a habit of pressing the button by accident—or even intentionally, so they could selectively ignore orders. Katz scrapped the feature in later versions. Some weapons self-inactivate to safeguard against civilian casualties. American land mines stop working after a set period, a bit of technology that the U.S. uses to justify its refusal to sign the 1997 Mine Ban Treaty. Cluster bombs feature timed self-destruction to protect civilians in the event that they don’t detonate on impact. The robots that defend American military encampments against enemy rockets fire bullets that self-destruct if they miss the target. Military engineers have some thoughts for how self-destructing technology might be used in the future. They envision an unmanned vehicle that can act as a “Trojan horse,” for example: If the device were to fall into enemy hands, it could either call an air strike against itself, or blow itself up—taking the enemy with it. Others speculate that a weaponized virus might be implanted with a trigger to destroy itself after a prescribed number of generations, so as to prevent a manmade pandemic. Explainer thanks David Axe, author of War Is Boring: Bored Stiff, Scared to Death in the World’s Worst War Zones; John Pike of GlobalSecurity.org; and Peter W. Singer of Brookings. Thanks also to reader John P. Shaughnessy for asking the question.